The craggy Dalmatian Coast, across the Adriatic Sea from Italy, is a treasure trove of sea resorts and dramatic scenery where mountains meet water. Cruise ship ports offer access to beaches, parks, offshore islands, tours for soft adventure and insights into the cultures of the western Balkan Peninsula. Most travelers have heard of Croatia's famous Dalmatian port of Dubrovnik, which appears on many cruise-ship itineraries between Venice and Athens. Not nearly as many cruisers have spent a day in Zadar. Zadar is a treasure trove of ruins and old churches that sit in the middle of a pleasant, comfortable, working city. 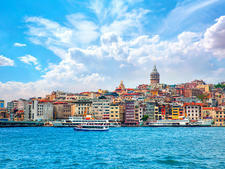 It's an easy city to explore, only a short walk from the cruise-ship dock to the city center. Streets in the Old Town are clean, and its historic sites are intriguing reminders of Zadar's tumultuous past. Yes, this city has suffered. It started when the Romans decided they wanted Zadar, which resulted in 200 years of warfare to subdue the locals, back in the 1st century B.C. The Venetians later conquered Zadar several times, but the town kept throwing them out, only to fall to the Austrians. 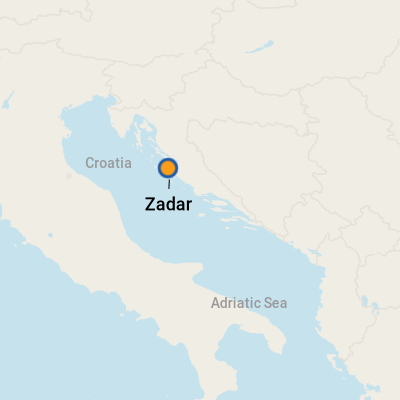 The Italians again ruled Zadar, followed by the French and then the Nazis during World War II, which meant bombs from the West until the Germans and much of Zadar were destroyed. The city then became part of Yugoslavia until that government fell apart. The city was shelled by Serbian forces from 1991 to 1993, cutting Zadar off from help from the mainland. The city remained in precarious shape until 1995. Today, the area has an energetic atmosphere, especially thanks to the young people of the local college. For visitors, Zadar offers two special places: a sea organ that plays music from the mastery of the wind and the waves, and the outdoor Forum Bar, where you may sip, sup and 'tsup -- that's checking in with your friends by cell phone to find out what's up -- as you sit in the ruins of a real Roman Forum in the shadows of a 9th-century church. The cruise-ship tie-up is one of the prettiest you'll see -- a white concrete dock at the edge of Old Town, next to the amazing sea organ, which, depending on the wind and waves, you can hear as soon as you get off the ship. There's a nice walk from the sea organ along the Western Quay, which has benches facing the water, used by locals as a picnic lunch spot. You'll find souvenir shopping opportunities, restaurants with beer and food, money exchange capabilities and Internet connectivity (wired and wireless) in the center of the Old Town, about a 15-minute walk from the dock. The Tourist Office is at Mihe Klaica 5, in the center of town (tel: 023-316 166). Many Europeans vacation in Croatia, including Zadar and nearby Pag Island, for its beaches and nightlife. However, as most cruise ships visit this port outside the summer peak season of July and August and don't overnight in port, cruise travelers may not get the chance to experience these major tourist attractions. Walking is the only way to move around the compact Old Town, where there are few cars on village streets. Most cruise passengers will confine their stay to the Old Town unless they are on a ship tour or their ships are in port for eight hours or more. For tours outside of town, ask for planning assistance at the tourist office in the Old Town, which also has bus schedules from Zadar to other towns in Croatia. The main bus station is a short walk outside the Old Town. 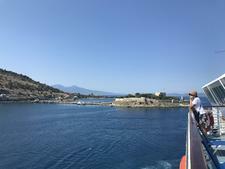 It's a busy place, as nearly every bus traveling up and down the Croatian coast stops at Zadar, but destinations may be out of reach for cruise passengers on short visits. There is also a ferry port on the eastern edge of the Old Town. Ferry schedules to nearby islands vary by day and season; check Web site for schedules. The local currency in Croatia is the Kuna. (Check XE.com for the latest exchange rate.) Merchants and restaurateurs will grudgingly accept euros, but almost none will take U.S. dollars. It's best to use a credit card wherever possible for the best exchange rate, though you'll want to change a small amount of money into Kuna for attraction admissions and inexpensive purchases. If your ship is stopping in Zadar and Dubrovnik, you will need a little Kuna in both Croatian cities. I spent about $30 in the two ports, and nearly half of that was for the 70-Kuna entrance fee to walk the city walls of Dubrovnik. There are ATM machines and exchange bureaus in the center of Zadar's Old Town, a walk of about 15 minutes from the cruise-ship dock. The tourism office in the center of town will direct you. The official language is Croatian, though just about everybody speaks fairly fluent English. 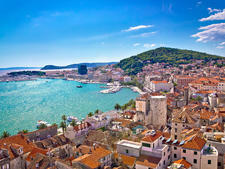 As Old Town is a busy center of locals, students and travelers, you'll find the usual range of cafes, pizza and pasta places, as well as restaurants featuring seafood from the Dalmatian Coast -- calamari, octopus, crab and scampi. Zadar has several konobas, traditional tavernas that feature an open-hearth fireplace and a storage cellar for wine and olive oil. They're considered to be the best places to experience typical Dalmatian cuisine. Once, they were places where fishermen hung out and got someone else to cook their catch for them. For a cool treat, sweet shop (slasticarnica) Donat, located near the Saint Stosija Cathedral, has excellent gelato. Looking for more of a bar-type setting? The newly redone Queen Jelena Madijevka Park is home to Ledena, where you can enjoy great views of Fosa Marina. Down the same street from Konoba Stomorica, Trattoria Canzona is a great bet for pizzas and pastas at reasonable prices. (Stomorice 8; Open daily, 10 a.m. to 11:30 p.m. and Sundays, noon to 11 p.m.). Maraschino liqueur is made from Dalmatian sour cherries -- including the pit and cherry tree leaves, as well as honey. According to local legend, the recipe originated in a Dominican monastery in Zadar during the 16th century. It is pretty strong, but I give this souvenir extra points for its historical perspective. Zadar's Museum of Ancient Glass (see Been There, Done That section below) is also a great place to pick up unique glass souvenirs.